Tammys Hill, one of the most reliable and consistent hunter chasers in Ireland, proved he could do the job in Britain too when winning today's CGA Foxhunter Chase. The nine-year-old, a 15/2 shot, won the 'Hunters' Gold Cup' by three and a quarter lengths from 40/1 outsider Carsonstown Boy, completing a one-two for horses trained in Northern Ireland. In third was On The Fringe, while Pearlysteps did best of the British in fourth, one place ahead of the 5/1 favourite Harbour Court. The result was a family affair involving the owner/breeder Patsy Smyth, who lives near Newry in County Down, and his son James, who milks cows for a living and was in the saddle today. 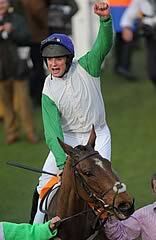 The winning trainer Liam Lennon rode "about 200 winners" as an amateur and finished fourth in the CGA Foxhunter Chase on Joe Blake in 2002. Lennon said: "It's a brilliant achievement for the Smyths. They bred this horse themselves, they reared him and fed him every morning from when he was a foal. The horse has never been a great traveller, but when Mossey Joe and Salsify came out of the race we decided to come here. I told James and my brother Declan, who travelled him over, to stop every two hours and give him a walk around - when they stopped in one field the farmer came out and asked what they were doing. When they said, 'This horse is going to win at Cheltenham', he said, 'Okay, carry on'. "But it's some achievement for James to ride a winner like this in his twilight years. I rode regularly for his father and won a race on this horse's mother. She must have been a good mare if I won on her! I finished fourth for Ian Ferguson in this race on a good horse called Joe Blake - I was past my best at the time and probably would have won on him at my peak. "That is the highlight of James' career - that was unbelievable - but I think this horse deserves a shot at a big pot like the Irish Grand National or something like that. Hopefully, things will lead on from there." James Smyth said: "He jumped to the front at the top of the hill and I took a hold of him coming down to the last three - he won the race anyway. He got in close but got himself out of trouble and did everything good. He went long when I needed him like a good horse does. "It couldn't get much better than this. I am happy enough riding around Cheltenham, never mind winning. I would say he is going to the Irish National next. I wouldn't think I will be keeping the ride as he'll only have 10st 2lb or 10st 4lb." Henry Daly, who trained the leading British horse, Pearly Steps, said: "He's run really well, and while a bit more juice in the ground would have helped him he's done his best. The owners are in the pen, which is where they like to be, even if it's a shame they are at the wrong end of it. "Ideally we would like to run him right-handed, so a day out at Punchestown might be the next plan."